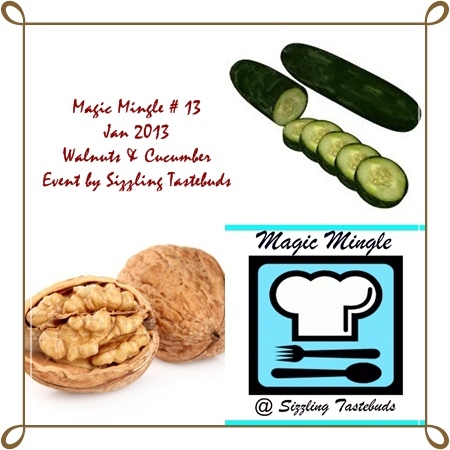 When Kalyani announced the Magic ingredients for Magic Mingle this month, which are cucumber and walnuts, the first thought which crossed my mind was salads. But that will be a very usual recipe. So I wanted to make something different. I have seen quick bread recipes using zucchini in the blog world. As cucumber resembles zucchini a lot, I decided to make a quick bread with it along with walnuts. I searched the web for any recipe and I ended up with a recipe for the bread. It had eggs and as usual I made some substitutions to make it egg free. I had 1/2 cup of sweetened whipped cream from a previous project. So I used it along with curd in this recipe as the substitute for eggs. The only thing I did wrong was to grease the tin with oil. A portion of my bread got stuck to the bottom. So it is better to grease the tin with butter instead of oil. Dust it with flour and your quick bread will not stick to the bottom. Though a part stuck to bottom, I was able to repair it. The bread was so soft and moist. The cucumber gave the moistness and the candied orange peel gave the necessary tang to the bread. Walnuts added to the crunch and totally it was a delicious bread. I also made it with Hudson Canola oil. This is the first time I am using canola oil and there was no difference in the taste. Enjoy it with a cup of coffee and you will be happy. 2. In a bowl, mix oil and sugar with a whisk. 3. Add cream and curd. Whisk until combined. 4. Add the grated cucumber, vanilla essence, candied orange peel and chopped walnuts. 5. Mix together baking powder, baking soda, cinnamon and flour. 6. Add it to the bowl and fold until combined. 7. Grease one loaf tin or two small loaf tins with butter and dust with flour. 8. Pour in the batter and bake until done. 9. If it starts browning fast, cover the top of the cake with a foil. 10. As I baked it in two loaf tins, it took 40 minutes. If using a larger tin then the time may extend upto 60-65 minutes. Keep a close watch on the bread. 11. Once baked remove from oven and cool in the pan for 10 minutes. 12. Flip the tins on a wire rack and remove the tins. 13. Allow it to cool completely. Mindblowing, you rock Gayathri, bread looks extremely fantabulous. A very unique combination and you have done a great job. healthy bread.and different flavors combined. Lovely cake!!! snaps are very good!!! easy to follow recipe! Bread looks nice and super moist. I love this combiantion, so healthy too! Looks so delicious!!! can we use milk instead of cream? would love to do this? Healthy n different from regular bread.. Recipe sounds very interesting Gayathri, will be making it soon..:).thanks for making it eggless!